10 Presidents, One Dictator: U.S.-Cuba Policy Fidel Castro took power in Cuba in 1959, at the height of the Cold War and the peak of U.S. concern over communism. Follow Washington's policy toward Cuba through 10 U.S. presidencies. Fidel Castro took power in Cuba in 1959, at the height of the Cold War, when the United States was focused on global communism as its greatest threat. Follow Washington's policy toward Cuba through 10 U.S. presidencies. In March 1958, the U.S. government suspends arms shipments to the Cuban government then headed by Fulgencio Batista, virtually guaranteeing the success of the rebellion led by Fidel Castro. The Eisenhower administration initially welcomes Castro to power, but concerns about Castro's politics and intentions lead President Eisenhower to snub Castro when he visits Washington in April 1959. 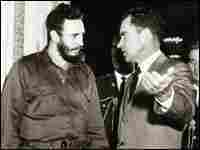 Castro meets instead with Vice President Richard Nixon. In May 1960, Cuba and the Soviet Union resume diplomatic relations, and Cuba begins importing Soviet oil. When American-owned refineries in Cuba refuse to refine the oil, Castro confiscates the facilities. In response to that and other nationalizations of U.S. properties in Cuba and to Castro's growing friendship with the Soviet Union, the United States places an economic embargo on Cuba in October 1960. Just before Eisenhower leaves office in January 1961, the U.S. government breaks diplomatic relations with Havana. The most tense moments between America and Cuba occur during John F. Kennedy's presidency. In April 1961, U.S.-supported exiles invade Cuba at the Bay of Pigs, a mission that was planned during the Eisenhower administration but executed only on Kennedy's orders. The Kennedy administration expects the Cuban people to rise up against Castro and aid the U.S.-backed invasion. When this doesn't happen, the Bay of Pigs mission ends when many of the badly trained fighters are captured or killed by Castro's army. In October 1962, U.S. reconnaissance planes photograph Soviet missile-construction sites in Cuba, setting off the Cuban Missile Crisis. In return for a Soviet agreement to remove the missiles from Cuba, Kennedy promises Soviet Premier Nikita Khrushchev that the United States will not invade Cuba again. However, covert missions to overthrow Castro continue. 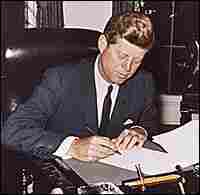 In February 1963, the Kennedy administration prohibits Americans from traveling to Cuba and from making financial transactions with the country. Under the administration of Lyndon B. Johnson, the United States continues to support covert operations aimed at overthrowing Fidel Castro, though Johnson abides by Kennedy's promise not to attempt another invasion. In November 1966, the U.S. government gives 123,000 Cubans permission to apply for permanent residence in the United States. Under the Cuban Adjustment Act, passed in November 1966, Cuban refugees who reach the United States are allowed to apply for residency, virtually guaranteeing an open door to all Cubans fleeing the Castro regime. By the end of the Johnson administration, the U.S. government has shifted its attention from Cuba to the deepening war in Vietnam. Richard Nixon officially ends all U.S. attempts to overthrow Castro and focuses efforts instead on Vietnam. No major U.S.-Cuba policy initiatives develop during his presidency. Gerald Ford is the first president to attempt to normalize relations with Castro's Cuba. The initiative ends in December 1975 in response to Cuba's deployment of troops to support the Marxist regime in Angola and to Cuba's support of the Puerto Rico independence movement. President Carter makes the second serious effort to reach out to Castro to normalize U.S.-Cuban relations. These efforts are derailed again when Cuba sends troops to Ethiopia in support of the Soviet-supported government there. In August 1979, the U.S. government announces the discovery of a Soviet combat brigade of 3,000 troops in Cuba. U.S. officials later conclude the brigade had been there since the 1960s, but had previously gone unnoticed. In April 1980, refugees begin a mass exodus from the Cuban port of Mariel to the United States after Castro announces that Cubans who wish to leave the island will be permitted to do so. Many of the 125,000 refugees eventually settle in Florida. The United States discovers that Cuban forces are building an airstrip in Grenada that could be used for military aircraft. This discovery, coupled with a coup by allegedly pro-Soviet elements in Grenada, prompts President Reagan to send U.S. troops to Grenada in October 1983. The Grenada intervention is the only time that U.S. and Cuban troops engage in combat with each other. The Reagan administration cites Cuban support for rebel forces in El Salvador and for the Sandinista government in justifying U.S. involvement in Central American conflicts. With the collapse of the Soviet bloc, Cuba no longer serves as a Soviet satellite in the Western Hemisphere. As of December 1991, Soviet subsidies to Cuba, worth $6 billion annually, are terminated. Cuba is no longer considered a serious security threat to the United States, but the Bush administration tightens the trade embargo in an effort to squeeze the Castro regime and hasten its demise. In October 1992, Congress prohibits foreign subsidiaries of U.S. companies from trading with Cuba, travel to Cuba by U.S. citizens and family remittances to Cuba. After Castro declares an open migration policy in August 1994, 30,000 refugees leave Cuba for the United States. As in the Mariel exodus, the United States regards the refugee outflow as threatening to U.S. interests, and the U.S. Coast Guard acts to prevent further migration. 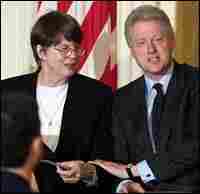 In October 1995, Bill Clinton becomes the third president to attempt to improve relations with Cuba. The effort ends in February 1996 when Cuban missiles shoot down two civilian aircraft in international airspace. Three Americans and one Cuban legal resident are killed. In March 1996, Congress passes the Helms-Burton Act, codifying the embargo against Cuba into law. The Clinton administration attempts to bypass Castro by promoting "people-to-people" contacts. In 1999, one of the most well-known attempts at migration to the United States occurs when six-year-old Elian Gonzalez is brought to Miami after he is found floating off the coast of South Florida. The Clinton administration seeks to allow Elian to return to Cuba. The Supreme Court refuses to intervene on behalf of those who wanted the boy to stay in the United States. He is reunited with his father in Cuba in June 2000. President George W. Bush orders a further tightening of the trade embargo with new restrictions on travel to Cuba and limitations on the transfer of money from Cuban-Americans to their relatives on the island. 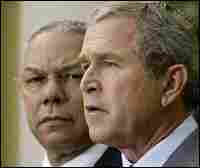 In 2002, some Bush administration officials charge that Cuba is engaged in research and development on an offensive biological warfare program. President Bush announces a program to assist the transition to a democratic Cuba once Fidel Castro and his brother Raul are both removed from power. Danielle Trusso contributed to this report.